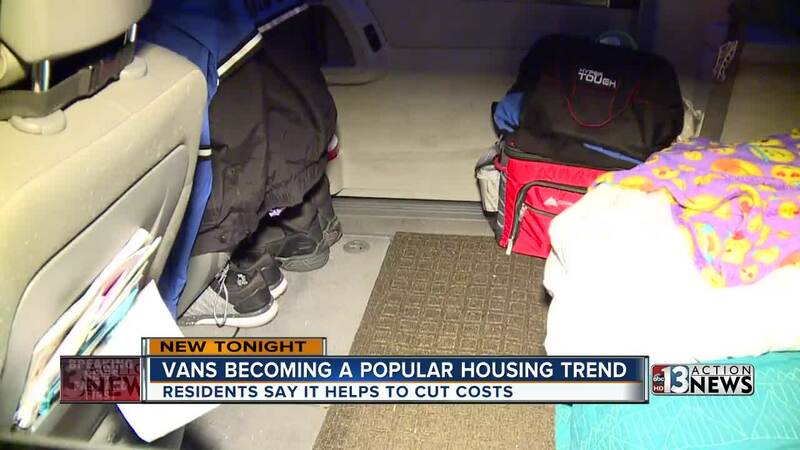 LAS VEGAS — A Las Vegas couple is trying an unusual solution for rising rental costs — living out of their van by choice, and saving more than $1,000 per month. The lifestyle is called "Van Life" and it is exactly what it sounds like. Lawrence and Liz Heller say the van life comes rent free and without utility bills but, instead, their major monthly expenses include their car payment, insurance and gasoline. The Hellers and their three dogs squeezed into the couple's 2011 Volkswagen Routan after Lawrence lost his job following an injury in August. The Hellers say the unfortunate situation left them with a difficult decision — use Liz's entire disability income on rent which would leave them nothing left over, or come up with a different plan. Las Vegas and Clark County routinely rank among the highest of per capita homeless in the country. Liz says the couple had been considering the purchase of an RV but the initial down payment was more than they could afford. Liz says moving to another apartment was not feasible due to rising rent costs which are now more than $950 on average per month in the Las Vegas valley. The Hellers began researching and found a variety of websites , discussion boards and Y ouTube videos that provide a wealth of information on the topic. "After everything that had gone on, we opted for the van life," said Lawrence. The Hellers say the transition was rough at first. "It looks like a typical so-called soccer mom van but in reality, behind those tinted windows, people are living," said Lawrence. The couple says they had to dramatically downsize which included giving away some family heirlooms. They are renting a storage unit, a mailbox that provides a physical address and re-homed their cats. "We do not have an electric bill, we do not have rent," Liz said. "All we have is our car payment, car insurance, storage and our mailbox." The Hellers say the van life certainly comes with its disadvantage: public restrooms, truck stops for showers and not being able to cook. The couple says when it comes to surviving the elements, they keep their van running to keep them cool in the summer and warm in the winter. Liz and Lawrence say the "Van Life" is not permanent for them and some day they would like to save up enough money for an RV of their own. In the meantime, they say they do not qualify for many government programs or additional assistance because they do not have children. The Hellers say many programs, such as Section 8 housing vouchers, have long wait lists or are simply out of money. "When people define the word homeless, people say 'well, you don't have a home to go to,' " said Lawrence. "That is correct, but at the same time, you kind of do."